Thu, Aug 2, 2018 at 6:00 – 7:30 p.m.
Start your weekend early with a relaxing evening making your own serving tray at our DIY Workshop, led by Barn Rat Studio. Bring your friends and bring your own wine (or beer or whatever😉)! 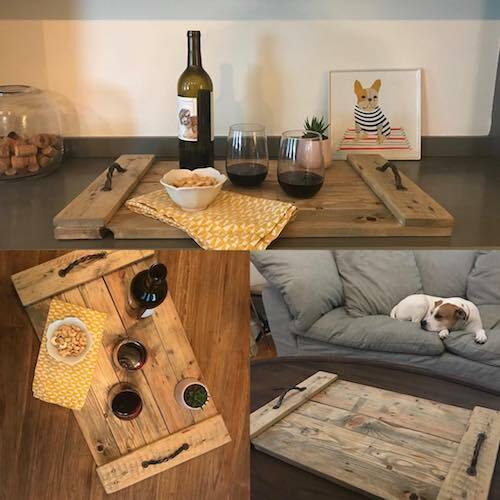 You’ll learn how to turn only a couple of pallet wood slats into a beautiful tray and finish it with a simple DIY finish made with a pantry ingredient. All materials will be provided, including upcycled palette wood, your choice of tray handles and DIY finish. No prior woodworking or power tool knowledge is required. Limited spots available! Barn Rat Studio is a maker running his own humble little studio in the Cincinnati area. He became a maker when he and his wife decided they wanted a few yard games for their backyard wedding. By the time the night was through, he had three orders from wedding guests for yard games. When it comes to his style of building, he likens it to bull riding – quick, dirty and a little rouge around the edges. But in the end, it is beautiful to look at. He loves palette wood, digs antiques and reclaiming and does amazing things with casework meant for a demo dumpster. Powered by Easterseals, Building Value is a unique store in Northside offering salvaged building materials at a great value. Proceeds benefit our workforce development program which offers valuable job training and job placement for individuals with barriers to employment. Since 2004, we’ve helped employ more than 250 individuals and salvaged 20,000+ tons of materials.